Create high-level, authentic assessments by combining Big6 with creative technology tools. How do we give students a creative, high-level learning experience that results in information literacy success? With the strong focus on the results of state mandated tests, we spend a large portion of classroom time preparing for them. It is difficult to find windows of opportunity for creative, higher-level, authentic assessments. We need these opportunities, however, to allow us to analyze a student’s level of information literacy and their ability to effectively evaluate and synthesize information. As a media specialist, I wanted to create an engaging project that focused on these higher-order skills. Mike Eisenberg’s and Bob Berkowitz’ Big6 research method guides students through information problem solving with the use of critical thinking. While working on designing a library skills curriculum, they decided that focusing only on resource and location skills was not enough. They created the Big6 process to look at the entire research process, including defining the task at the beginning, synthesizing the information to communicate ideas, and evaluating the product and the process at the end. At a local conference, I attended a presentation that showcased student work with Share. I was impressed with how the process of building web sites requires students to present material in a logical, organized approach. I was certain this exciting, real-world platform would lend itself well to engaging students as they learned information literacy skills. Knowing both the Big6 and creative technology tools like Pixie and Share lend themselves to authentic assessment, I designed a project that had students take the information they gathered from the Big6 process and synthesize it in the form of a web site. Over the next six weeks, I worked with a fifth-grade class during their fixed, biweekly library instruction time, as well as additional times in collaboration with their classroom teacher. When I informed students that their end product was going to be a web site they would create on their own, they immediately became excited. Since my goal was information literacy, not specific content knowledge, I allowed students to choose their own topic. While they were already motivated by the idea of creating their own web site, permitting them to choose their own research problem truly got them engaged. How many people were on the ship? Were there any warnings about the icebergs? Before students moved on to the next step, I reviewed each of their fifteen questions to ensure they were on the right track. Next, I had students ask themselves, “What can I use to find what I need?” Individually, students employed information seeking strategies by brainstorming a list of all possible resources they could use to find the answers to the questions they had developed. Students easily thought of books, encyclopedias, and web sites, but I asked them to take their brainstorming process one step further by thinking creatively about where they could find information. In the case of Abby’s Titanic project, she listed her grandparents, who had just been on a cruise, as a resource. Another student suggested that Abby speak with a boat salesman. Once students compiled their list of all possible resources, they began to determine where they could locate and access these sources and how they would get the information to answer their questions. To make searching for their information easier, I asked the students to create a list of keywords or key phrases related to their topic. I then asked them to determine how they were going to locate the information within each source. This provided me with an opportunity to review reference sources and how they are used. For example, with nonfiction text, I discussed the use of captions, pictures, and the importance of the index and table of contents; with encyclopedias, I was able to review the importance of the “see” and “see also” entries. Next, students determined what information could be used as they started taking notes from the sources they had identified. Since many of the students struggle with note taking, we reviewed various strategies ranging from the basic read and highlight method to the “trash and treasure” method. As long as quality information was extracted, I did not restrict the students to using one particular method. I did, however, require that they document their sources, as understanding copyright is essential to the information literacy process. During this stage in the process, many students began to identify more questions and discover some of their questions were not relevant to their research topic. I encouraged them not only to look for answers to their questions from the first step, but also to take notes on any interesting information they believed might contribute to their web site. Now that students had gathered their information, they began to synthesize it to determine what they could create to finish the project. To help them organize their thoughts, they created a storyboard to categorize their information and present it in a logical order. To keep the students focused, I gave them a basic storyboard with six blank squares, each representing one page in their site. I encouraged them to divide their information into subtopics, or chapters, and use their home page as the table of contents. 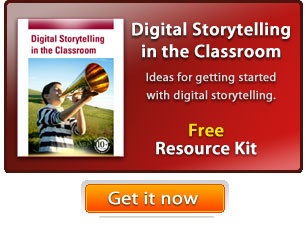 Once they completed their storyboard, they were ready to begin authoring in tools like Pixie and Share. I was amazed by their excitement as they began working in Share. One student had worked with his father to find Share online, download the trial version, and begin practicing. He came in prepared and proud, exclaiming, “I already figured out exactly what I’m going to do. I can’t wait to show you the cool things I figured out!” The other students quickly figured out the basics, since Share’s approachable interface made creating the sites easy. Rather than struggling to learn all of the features, students were able to focus on sharing their content. To avoid ending up with a group of web sites with fantastic backgrounds and animations, but no content, I required the students to first enter their text and link between pages. It wasn’t until that was finished that they could add graphics, sounds, and animation. They used media from the library and Pics4Learning.com to find images that correlated to their information. When the web sites were complete, students evaluated their project to ensure all criteria had been met. They completed a self-assessment of their own sites and reviewed and shared their reactions to other students’ sites. As a group, we discussed the information literacy skills they had used and how they could apply these skills in other situations. After nearly two months of dedicated work, students successfully completed the project. To celebrate, we invited parents, administrators, central office staff, teachers, students, and community members to view the web sites on which the students had been so diligently working. At the conclusion of this project, it was apparent when given the proper tools, students are capable of much more than just regurgitation of information. After completing the Big6 process and using Share to communicate the information they had found, students were not only able to process and connect the information to authentic life experiences, but creatively convey these connections as well! As a result of the project, students also demonstrated significant growth in the area of information literacy. Not only did students have the answer to their research problem, but they knew how and where to find these answers. Instead of just knowing the date the Titanic sank, Abby was able to tell you from where she got her information, how she found it, and why she chose one resource over another. Students who once thought the Internet was the only place to get information for an assignment were now consulting books, encyclopedias, databases, and newspaper articles. When students did go online, instead of typing an entire question in to a search engine, students were now identifying keywords and searching smarter, not harder. As an educator, there is nothing more rewarding than inspiring my students to become excited about learning. Combining the Big6 method and a student creativity/productivity tool like Share provided students with both the tools and outlet to illustrate information literacy through creative, authentic products.